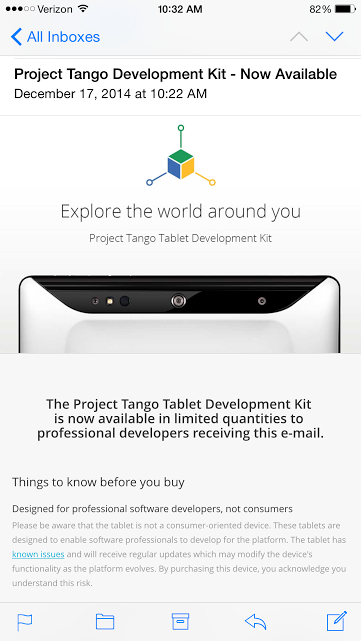 The below email is being sent out to developers this morning, advertising the Project Tango development kit as “now available.” But it appears nothing has changed on the Play Store front and that receiving this message simply means that your specific email address has been whitelisted for purchase. 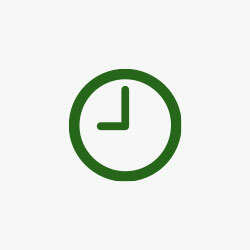 Google warns potential buyers in the email that the tablet “has known issues,” “is not a consumer-oriented device” and is “designed for professional software developers.” But if you’re a developer and you’ve received this email, the device is now open for you to buy, and it’s going to cost you a steep $1,024. For the rest of us regular joes who might be interested in getting a Project Tango for one reason or another, Google has said that the consumer version won’t be hitting store shelves until 2015. Hopefully that version will be a little bit more affordable. Earlier this year in August, iFixit gave the device a teardown and revealed some interesting tidbits about its hardware.